For this photo, I tried to mirror the image quality of the display as closely as possible. I’ve been thinking about pulling the trigger on a new display. Not because there’s anything wrong with my current one, but after the kerfuffle that was made by Dota 2 players at the Shanghai Majors over not having 120Hz monitors to compete on, I figured I wanted to see what all the fuss is about. A little back story: since December 2014 I’ve been running with a Dell P2715Q, a 27-inch, 60Hz, 3840×2160 IPS display that was a substantial upgrade from the U2711 display I had previously. It’s pretty nice, with a few caveats: since my primary usage is with the display attached to my MacBook Pro, running it a native res means things get pretty unreadable unless I’m pumping up the size of everything. It’s fantastic when using a scaled resolution (I use a tool called EasyRes to switch between resolutions quickly), as it gives the quality of a “Retina” 2560×1440 display (3840×2160 downscaled to half that), making everything as crisp as the freshest iceberg lettuce. So I run my wonderful series of pixels at a non-Retina 2560×1440 when plugged into my Mac, even though text looks worse that way, and I have no more screen real-estate than I did with my previous screen. My PC is a different story entirely. I like to think I have a pretty great graphics card in the GTX 980, which lets me run whatever resolution I like a a near-constant 60 FPS. And because I hardly play anything other than Dota, which runs on the Source 2 engine, it means I can run that game at the native res of my monitor without getting any noticeable frame-rate drops. Newer games like Dragon Age Inquisition, Fallout 4, or The Division are more of a toss up – I can either choose between maxing all the settings at a lower resolution, or turning down the fanciness for more resolution, and what’s “better” mostly depends on the game. I’ve experimented with >60Hz monitors before. 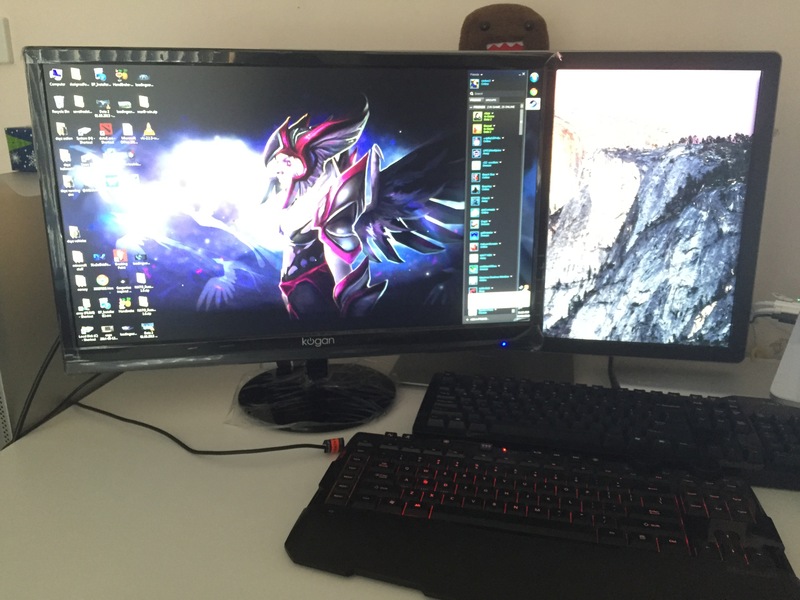 A few months before moving to Brisbane, I picked up a cheapie 144Hz display from Kogan to use for gaming. The colours were average, the resolution was inadequate for anything other than gaming, but overall I think things did feel “smoother”, even if it was just some kind of placebo effect. Alas, when making the move to Brisbane I left that monitor behind. On the plus side, it now leaves me the chance to upgrade, but therein lies my dilemma — do I buy the same thing again and use it for a longer period of time to see if I can tell the difference, or do I get something a little nicer? Buying a 1080p display in 2016 seems like a waste of time — 1080p isn’t a useful resolution for anything other than gaming. And if I’m getting a gaming monitor, I might as well get something that has G-Sync, seeing as I’m Team Green for the long haul. Anything more than 24-inches is overkill for my desk, but at the other end of the scale, a 144Hz, IPS, G-Sync capable display runs into the four digits, which is more than I paid for my 4K Dell. I mean, the Kogan cheapie was worth it because I only used it for gaming and nothing else. I can’t justify spending four digits on something that’s only going to get used when I’m gaming, even if I do that every day and twice on Sunday. I have no desire to run a triple-head setup on my poor MacBook Pro, as I already have enough resolution and real-estate there to keep me occupied for days, and I won’t have any idea what to do with another 27-inches. The best compromise for my ideal gaming display right now is a 24-inch, 1080p, 144Hz, G-Sync, IPS display, but it seems like nobody is making one of those. AOC and Acer both sell a 24-inch, 1080p, 144Hz, G-Sync display with a TN panel, but even it goes for around the $500-600 range. If I cut IPS and G-Sync from the list of requirements, the price drops to around the $400 mark, but then I’m losing out on some seriously interesting display technology. It’s probably not worth spending the extra $400 for the extra size, resolution, and image quality when I’m “only” going to be using it for gaming, right? Two of my friends have higher-than-60Hz refresh rate monitors now, and both of them swear by it. Now that I want to try out a higher refresh rate, it seems as though there’s no product out there that satisfies all my needs, and all that remains is a compromise, one way or another.